Dienekes’ Anthropology Blog: Dual origins of Sub-Saharan Africans? You do not see there 68% Eurasian admixture, but if anything something20%. However the experiment is designed to produce this result because non-Africans are oversampled and the non-Pygmies are more closely related to Eurasians, being all part of the L2"6 African mtDNA clade, while Pygmies belong to an older divergent line (L1). 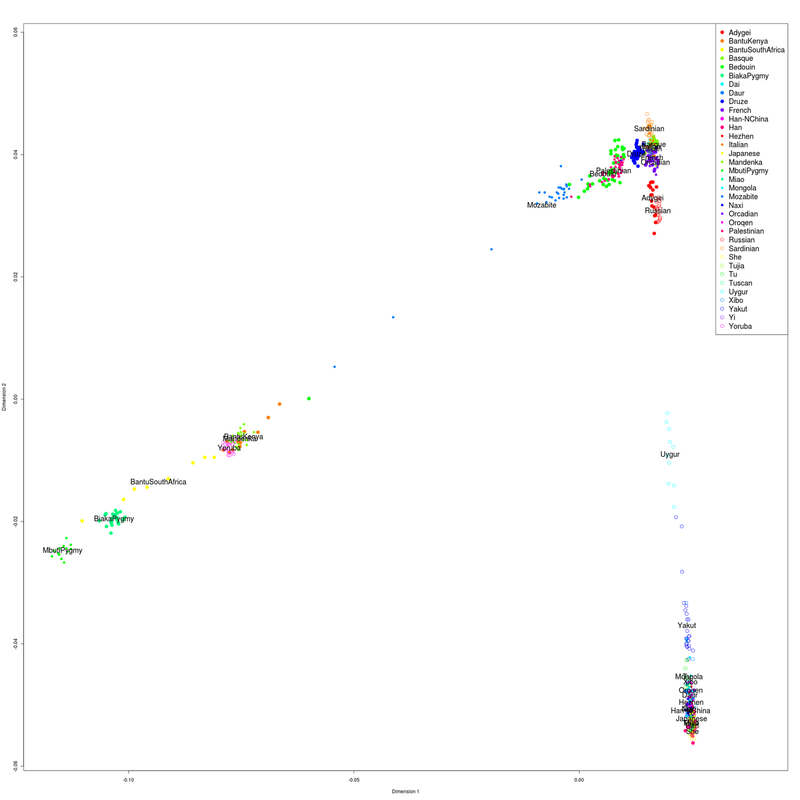 So if anything at all you're measuring a complex degree of interrelation (and admixture) between various African populations which probably existed in the past separately: L1 and L2"6 but also L2 and L3'4'6 (this one eventually producing the Eurasian branch). >> However the experiment is designed to produce this result because non-Africans are oversampled and the non-Pygmies are more closely related to Eurasians, being all part of the L2"6 African mtDNA clade, while Pygmies belong to an older divergent line (L1). West and East Eurasians are both part of this clade, so the fact that Sub-Saharan Africans are on a cline to _West_ Eurasians cannot be explained away by to this shared mtDNA heritage. >> You do not see there 68% Eurasian admixture, but if anything something20%. Mbuti Pygmies are themselves 30% within Y-haplogroup E, so they cannot be assumed to be pure of this influence. Biaka Pygmies are 45% E, placing them exactly where they're found on the PCA plot. There are no longer any populations devoid of Y-haplogroup E influence, so Eurasian admixture is systematically underestimated by comparisons with current African foragers. "and Pygmies who lived on the edges of the forest, which at the end of the Pleistocene extended farther north and east than it does now". Maju, a question. How does that show humans have inhabited the deep tropical rainforest 'forever'? Eastern Pygmies (Mbuti) have very little to no L1. Here are the Mbuti mtDNA frequencies: L0a2 25%, L2a2 65%, L5a1 10%. Western Pygmies (Biaka) are almost completely L1c. However, it looks like this lineage underwent a strong founder effect in them, since it is practically the only lineage they have. While West African agriculturalist groups' mtDNA is usually 1/3 L0-L1, 1/3 L2, and 1/3 L3. The higher L3 and E is most likely what causes West Africans to shift more towards Eurasians relative to Pygmoids and Bushmen. Whether L3 and E are ''Out-of-Eurasia'' lineages or not is a matter of debate. I fail to see any Eurasian mixture in these Africans, you used San Bushmen and Pygmies as de fact proxies for "pure True Africans" and got these results which isn't surprising considering that both the San and Pygmies straddles near the root of the hypothetical most ancient human ancestor. They're distant from other Africans, but the distance of these other Africans is not due to variable Eurasian mixture, but when read in a typological manner one would think this. Mixed populations and those that are not mixed can behave the same way on a PCA plot. >> I fail to see any Eurasian mixture in these Africans, you used San Bushmen and Pygmies as de fact proxies for "pure True Africans" and got these results which isn't surprising considering that both the San and Pygmies straddles near the root of the hypothetical most ancient human ancestor. If you have a better explanation why Sub-Saharan Africans are arrayed on a cline going from Mbuti Pygmies to Europeans, I'd love to hear it. Hand-waiving does not cut it as an explaantion. "Methods for addressing continuous, spatial population structure are still under development, but principal-components analysis (PCA) has been widely applied in this context.60,61 The expected behavior of PCA on evenly spaced samples from spatially structured data is to return coordinates that are related to the geographic origin of each individual.62 Moreover, there is a clearly established relationship between the genealogical structure of a sample and the principal components, grounding PCA in firm principles of population genetics.63 One caveat of PCA-based approaches is that if individuals are a product of “recent admixture” from disparate origins, it will assign individuals to a single origin that is intermediate between the source populations, which is incorrect (e.g., an individual with an East Asian and European parent will be indistinguishable from an individual from Central Asia). This reinforces the need for models that take these and other limiting factors into account and recognize that in some cases accurate social identifications cannot be made." All you've shown is that depending on how one manipulates the settings and methods one can get any results. Are you planning to make similar analyses on publically available full genome sequences anytime soon? The above sentence means absolutely nothing. The HGDP populations are what they are; no selection on my part is involved. The issue -which you ignore- isn't the relative positioning of the Caucasoid populations -who form a tight blob- but the stretched out position of the Negroid ones towards them. >> All you've shown is that depending on how one manipulates the settings and methods one can get any results. Incorrect; it is impossible to "manipulate the settings and methods" to make Sub-Saharan Africans form a cline towards East Eurasians. They only form one towards West Eurasians, because of their West Eurasian ancestry. A more complete picture would be available if you could look at dinka or nuer genotype as these populations are subsaharan and it is suggested that they might have common origins with west africans linguistically. However their paternal markers are mostly A and B with no E3a. Based on your hypothesis this population should have very little eurasian admixture, thereby confirming or disproving the hypothesis. We actually have a Dinka sample from 23andme and that particular individual clusters closer to non-Africans than their Niger-Kordofanian speaking counterparts. The Dinka individual clusters in between NE Africans and West Africans; his results are supported by Tishkoff et al. 2009 who also sampled Nilotic groups from S. Sudan. He also doesn't seem to share any recent ancestry with Eurasians, given that he scored 100% African on 23andme. Basal E1b1a clades are apparently found in Ethiopia, but lacking in the Sudan. This could possibly mean that the ancestral population which brought E from East to West Africa could have died out in the Sudan region. Or perhaps E spread via a more northern/Saharan route towards West Africa rather than through the Sudanic regions. Therefore, if Dienekes' hypothesis is correct, even modern pygmy and Khoisan samples should be shifted toward Western Eurasians in comparison to the (no longer extant in pure form) "Palaeo-Africans." Have any fossils that might represent "Palaeo-Africans" been tested for ancient DNA? Have you speculated about which main West Eurasian component is the main one found among Africans? Could it possibly be similar to the ''Southern'' component found in the K7b analysis? Or is it something completely different?